The following post is from a sponsored trip with New Orleans & Company. Head over to their page for all the Mardi Gras info you can need, including the Mardi Gras bucket list, Mardi Gras like a local, FAQs, etc. Hope we see you there next year! It’s an iconic event that we’ve had on our bucket list for years. Parades, beads, glitter, costumes, dancing - Mardi Gras is one of the biggest parties in the world, and we finally understand the hype. We just returned from a trip to New Orleans where we got to experience our first Mardi Gras parade, and it was everything we could have dreamed it would be! We had the TIME OF OUR LIVES - and the joy on our faces say it all! We decided to visit New Orleans the last weekend in February, which happened to overlap with the very beginning of the Mardi Gras celebrations. The city was abuzz with preparations and Mardi Gras decor was everywhere, but crowds were minimal and hotels weren’t at capacity. The deeper into Mardi Gras that you get, the more crowded the city becomes and rates for hotel rooms can reach an all-time high. Mardi Gras “season” starts 12 days after Christmas, and then culminates the Tuesday before Ash Wednesday. If it works with your schedule, we suggest planning your trip for early in the season, then you can explore a more mellow New Orleans, but still get to join in with the Mardi Gras festivities. In terms of hotels, we recommend staying somewhere within walking distance of all the excitement. We stayed at Le Pavillon, a beautiful four star hotel in the Central Business District that is a 5 minute walk to the French Quarter (We’ll share more about our hotel in our next post!). It’s an even shorter walk to St. Charles Avenue, where many of the Mardi Gras parades roll through! We find it crucial to be close to all the action, but then be able to retreat to a cozy, quiet, and relaxing hotel. We saw “The Krewe of Cork” parade, which celebrates food, wine, and a good time - three of our favorite things! The Krewe members wear wine-related costumes, toss necklaces with their cork logo, and are even accompanied by “wine police”, whose motto is “To serve and pour”! While we highly recommend dressing up for the theme of whatever parade you are attending (something we will definitely do next time), there are no rules when it comes to Mardis Gras! People wear whatever they want, and it makes for some glorious people watching. MARDI GRAS IS FAMILY FRIENDLY! Ask any seasoned Mardi Gras attendee, and they’ll say that the best way to view a parade is from above! 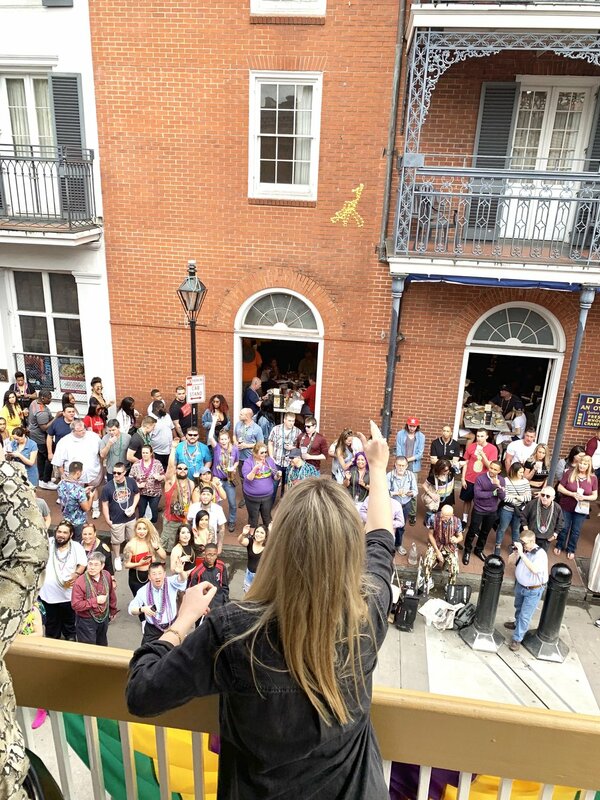 It’s people watching at its finest, and throwing beads from a balcony is so much fun. 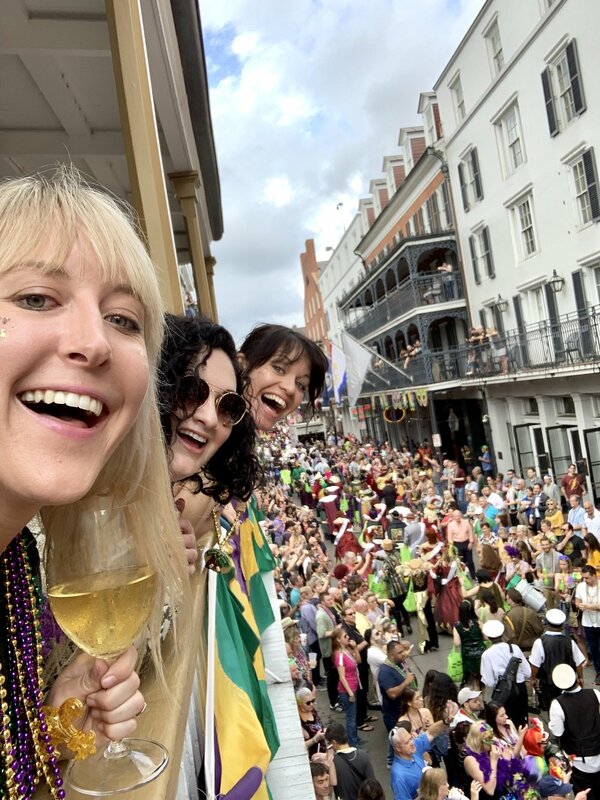 We watched The Krewe of Cork from the balcony at Arnaud’s, but we’ve also heard great things about the event space Bourbon Vieux on Bourbon Street. A ticket will get you access to their large wrap-around balcony, gourmet cuisine, and a premium open bar. In our opinion, that is truly the way to go! Loving the views with our new pals! Mardi Gras can feel overwhelming for a first timer, but it doesn’t have to. Order a Mint Julep to go from Napoleon House, throw some glitter on your face, and get ready for the biggest, most eclectic block party you’ve ever seen… chances are you’ll want to make it a yearly tradition!